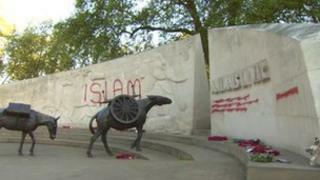 Vandals have daubed the word Islam in spray paint on war memorials in Green Park and Hyde Park in London. Police were called to the RAF Bomber Command War Memorial at 05:00 BST and found engravings on the monument covered with paint. Vandals did the same thing at the Animals in War Memorial in Hyde Park. A police spokesman said Royal Parks officers were investigating and Westminster City Council had been informed. Westminster City Council cabinet member for city management councillor Ed Argar said: "We deplore any act of vandalism or graffiti that desecrates memorials put in place to honour those who fought for our country's freedom. "We will do everything we can to clean and restore the memorials as swiftly as possible." The RAF Bomber Command pavilion, built at a cost of £6 million in Green Park, was opened in June 2012. It commemorates the 55,573 members of the Bomber Command who lost their lives during World War II. The Animals in War Memorial was designed by English sculptor David Backhouse and unveiled in 2004. It honours animals that have served and died for the British military forces.